Doxiderol Review – Bona Fide Study Pills or Expensive Caffeine? Who says “Study Pills” and “Expensive Caffeine” have to be exclusive? Otherwise, with all of the coffee, soda, & energy drinks we drink, we’d all be brain healthy geniuses, right? But the thing is, we’re not: We’re just pretentious caffeine junkies. Yet, what happens when a nootropic stack mixes these two exclusive products (study pills & expensive caffeine) into a single formula? Does the sum become greater or less than the parts? By the end of this review on Doxiderol, the latest in caffeinated study pill nootropics, I’ll have the answers to these questions and more. From Mentis Laboratories comes Doxiderol, a focus-enhancing “study pill” designed primarily with students in mind. Initially, Doxiderol looks like another over-glorified caffeine pill, but the high concentration of bona fide nootropics rectifies this notion. 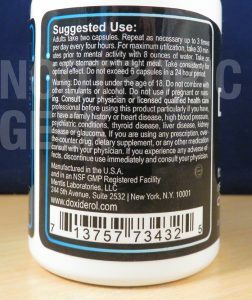 The majority of Doxiderol’s formula is hidden underneath the Doxiderol Proprietary Blend, which is annoying if you’re a fan of knowing what’s in your supplements. Other Ingredients: Magnesium stearate, silica. Directions: Adults take two capsules every 4 hours. For maximum utilization, take 30 minutes prior to mental activity with 8 ounces of water. Take on an empty stomach or with a light meal. Take consistently for optimal effect. Do not exceed 8 capsules in a 24 hour time period. 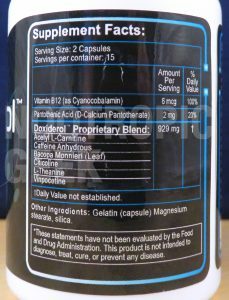 Vitamin B12 (Cyanocobalamin) – Cyanide is nasty, y’all, which is why I prefer the Methylcobalamin form of B12. But this low dose B12 is decent for cognitive health, namely for ye olden folk & vegetarians. More on Vitamin B12. Vitamin B5 (D-Calcium Pantothenate) – B5-deficiency is rare, so I can’t see this ingredient helping many users. Vitamin B6 would have been the better, more nootropic option. Acetyl L-Carnitine – ALCAR is the nootropic form for brain health, so props to Doxiderol for that. But our understanding of this ingredient has yet to coagulate. Current research seems to suggest it only improves “aged brain function.” More on ALCAR. Caffeine – You know what caffeine is. Cheap, non-nootropic mental stimulation. Mm-mm, delicious! Wake me up before you go-go-go-go-…! Bacopa Monnieri Extract (Leaf) – One of my favorite nootropics for its anti-stress adaptogenesis and pro-memory benefits. Requires long-term supplement to achieve peak effect. More on Bacopa. 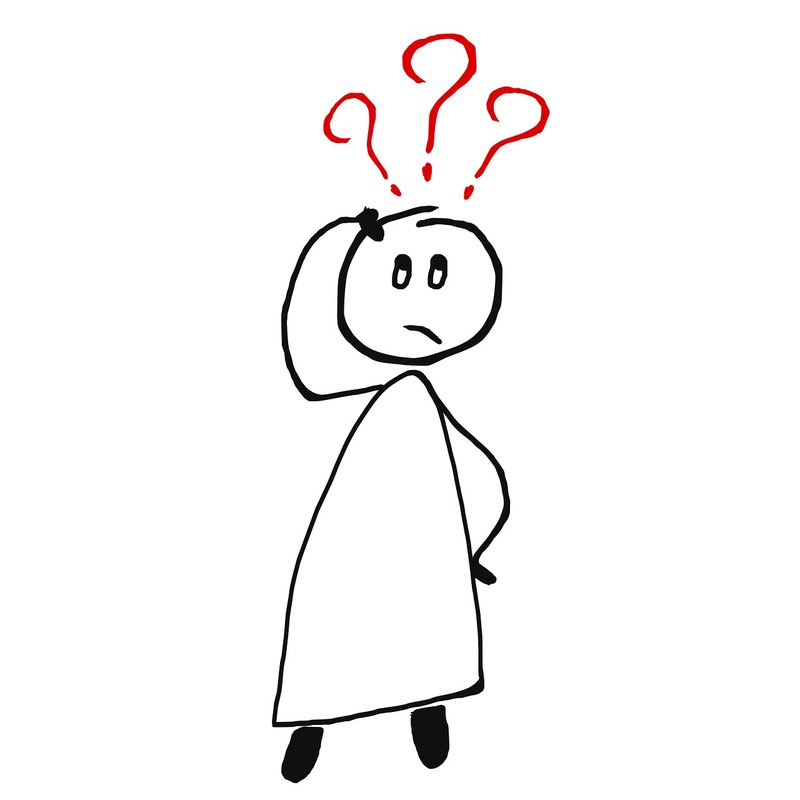 Citicoline – Awesome source of choline, and an even awesomer nootropic. 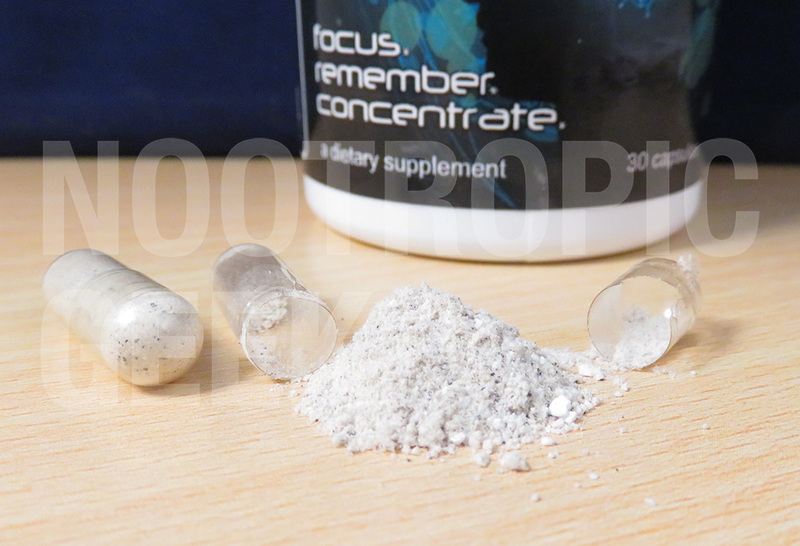 This multipurpose nootropic that enhances cognition, memory, & all-around brain power. More on Citicoline. 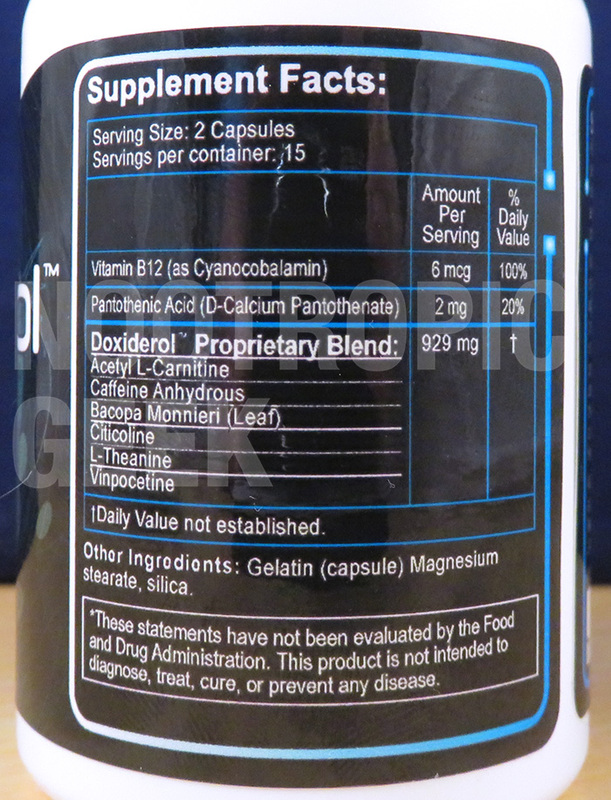 L-Theanine – This amino acid makes Doxiderol’s caffeine okay for its complementary “relaxation” effects. Essentially, you get the focus of caffeine minus the jitters when you toss in this famous green tea compound. More on L-Theanine. 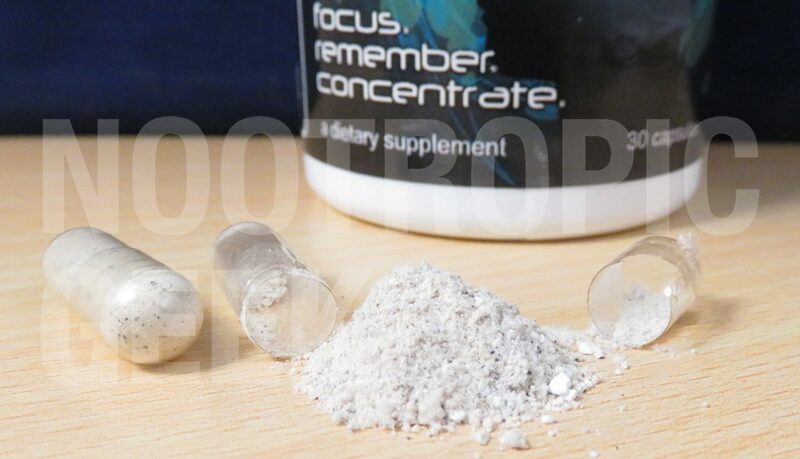 Vinpocetine – In tiny doses, Vinpocetine has significant nootropic value for its improvement of cerebral circulation, increasing delivery of oxygen & nutrients to the brain. More on Vinpocetine. The problem with post-grad job applications is that, despite the hours of education & the degrees, most resumé’s “Experience” sections are left blank–or filled with contrived experiences & skills (e.g. “versatile, dynamic, results-driven retail entrepreneur”) in lieu of the more honest job descriptions (e.g. “Hollister Sales Associate”). While I agree with Observer and San Francisco Chronicle, this doesn’t tell me much about Doxiderol. Which may mean that Doxiderol simply needs more time to earn a bona fide consumer base. Citicoline. For memory & brainpower. Bacopa. For stress & learning. L-Theanine + Caffeine. For focus & attention. Plus, the Vinpocetine enhances cerebral circulation for a better nourished brain and ALCAR may improve aged cognition. That’s some tightly packed bio-diversity in this formula, which I find impressive. The only drawback being the Proprietary Blend design choice as it hides the individual ingredient dosages. This is especially concerning with Caffeine being the 2nd heaviest dosed ingredient of the blend–yet, it looks like there’s enough milligrams to adequately cover all of the ingredients here. We’ll just have to give it time to prove itself on the nootropic job market before we rank it among the elites, as Doxiderol has the potential. Citicoline, Bacopa, L-Theanine, & Vinpocetine are among my favorite nootropics and Doxiderol has them. Markings of a truly smart pill. The Caffeine + L-Theanine duo is perhaps the only right way to do Caffeine, if we’re hoping for nootropic brain activity (rather than cheap stimulation). Aside from the B vitamins, most of the ingredients are in their nootropic forms. Proprietary blends are a major drag, especially in caffeine-wielding formulas. The B Vitamins need to be revamped or removed. 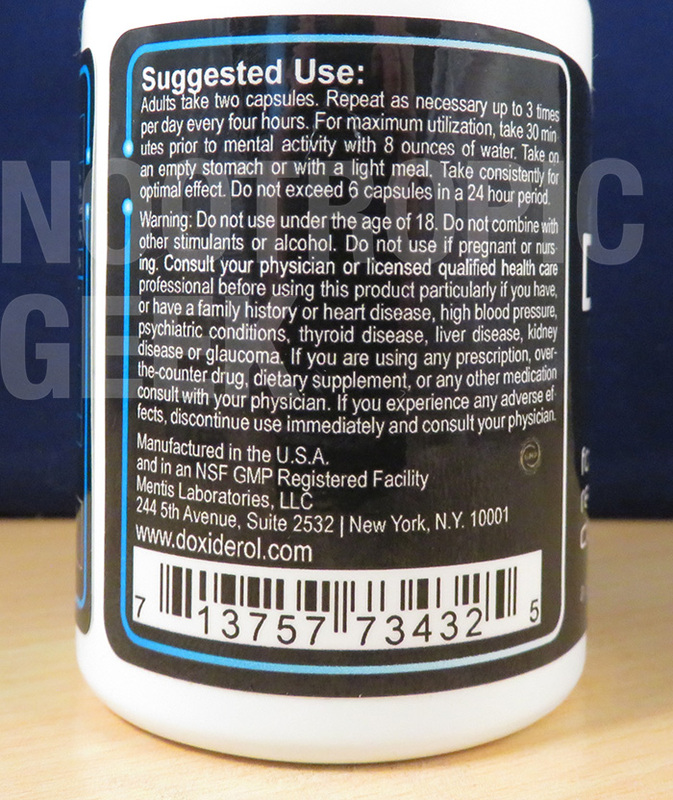 Judging by the directions, Doxiderol potentially provides less than a 15-day supply. Even at a 15-day supply, Doxiderol seems needlessly expensive. Doxiderol subtly plays off of the Adderall brand, selling itself as a low-key smart drug alternative. As such, I wouldn’t recommend it as a true alternative to Adderall, but it may help to sustain brain energy without compromising brain health. 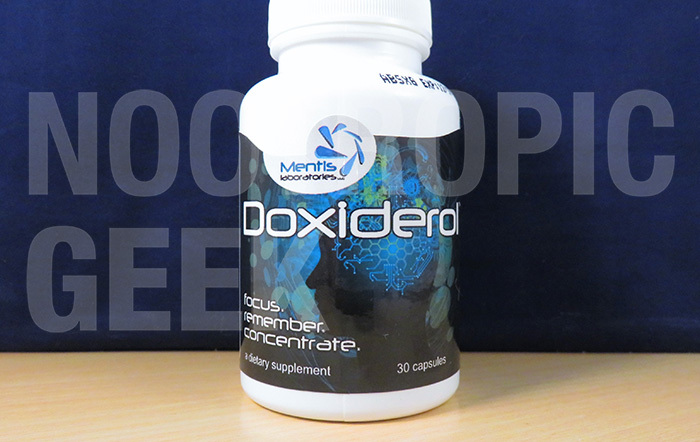 Doxiderol is available through various online retailers as well as directly through Mentis Laboratories, who seem to offer more purchasing options. Doxiderol is ready to work. What’re you asking me for? 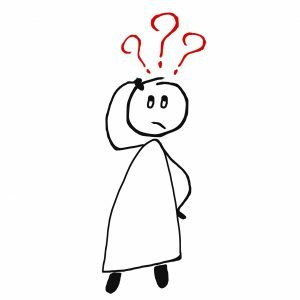 Despite the “question marks” surrounding this formula, Doxiderol is a product that many should be willing to try–if not for the awesome nootropics that primarily make up its formula, then as a healthier source of caffeine (than, say, coffee). Due to the rampant abuse of Adderall & “smart pill” substances, the nootropic market has been developing a bad habit of churning out cheap, stimulating caffeine pills and labeling them as “Adderall alternatives” or, worse, as “nootropics.” Thankfully, Doxiderol places a huge emphasis on brain healthy nootropics in addition to caffeine for its “Adderall alternate” formula (which I personally wouldn’t consider as an adequate Adderall replacement–at least not without a side of, say, piracetam or Noopept). So does Doxiderol work? Sure. At the least, it works as well as caffeine. At most, it works like a nootropic. 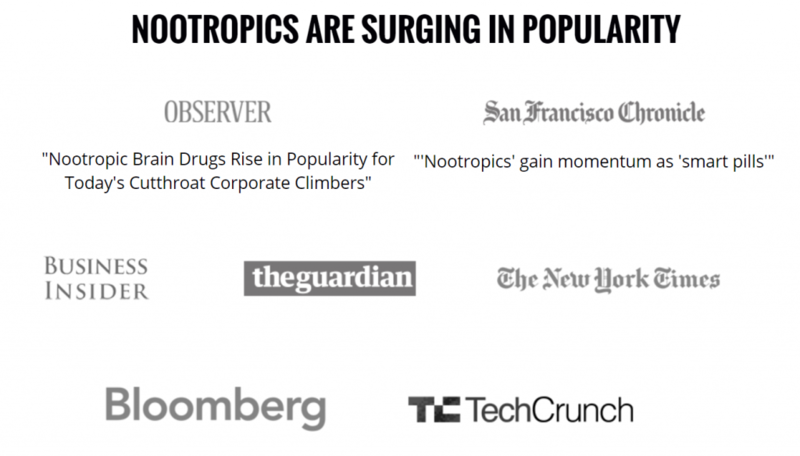 And you know me loves me nootropics.